I am starting this blog because (a) I love shoes, it's up there on my 'most loved' list along with cheese, ice cream, buffy the vampire slayer, the boyfriend, and sleeping. (b) I have a lot of shoes...more than I care to admit. Let's just say I have enough pairs of shoes that I can't count them all... and (c) because I have so many pretty shoes (IMO), I feel like none of them quite get the attention and appreciation that they deserve (look at that, I'm talking as if my shoes have feelings...you will soon learn that I am crazy, but, again, more about that at another time). I know that there are a LOT of shoe/clothes/shopping blogs out there, so I plan on throwing in some twists and turns to keep you hooked! Or, at least I will try my best :-D That's all for now! Yay for shoe loving science nerds! and your doggie is adorable! yeah, who says nerds can't be fashionable as well? 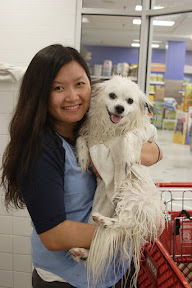 The dog's name is Roxy, and she just had a bath right before the pic was taken. Nice blog, Chee. Purvi forwarded this link to me. I am too into shoes, but not so much. But your blog is pretty to look at !